"Mr. James F. Seaver was born in Indiana May 13, 1842, and died at the home of his son, J.A. Seaver, near Grogan, Texas county, Missouri, January 23,1926, making his age at time of death 83 years, 8 months and 10 days. "Grandpa, as he was always called, was very strong for a man of his age; although blind for the past ten years, he was able to make his way around the house and even out to the wood yard and back to the house without help, but some time during last November he was stricken with a pain in his right foot and leg. Everything that medical skill and loving hands could do was done, but to no avail. "He was married to Mary A. Cline (date not known), and to this union four children were born, two of whom survive him: Andrew J. Seaver, who lives in Montana, and John A Seaver, of Grogan, Mo. The other two children, Charles and Millie Seaver, died when very small. His wife died a good many years ago. He was married again to Elizabeth Palmer, no children being born to this union. His last wife has been dead a number of years. "He is also survived by grandchildren, great-grandchildren, other relatives and a host of friends. "He professed a hope in Christ and joined the church when about 25 years of age and lived a true christian life, always ready to help others so far as able; enjoyed going to church very much, but on account of his blindness could not get out very much. "The undertaker was called and prepared the body for burial, being shipped to Scotland county, Missouri for burial. His son, J.A. Seaver, accompanied the remains, and Mrs. Seaver going as far as Springfield, she being called there by the serious sickness of her sister. 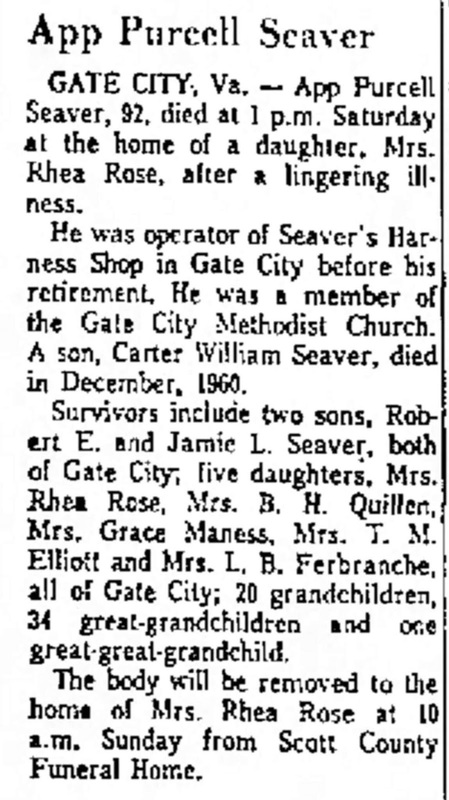 "Death of James F. Seaver" Houston [Missouri] Herald newspaper, obituary, Thursday, 4 February 1926, page 3, column 2, James F. Seaver obituary; Newspapers.com (https://www.newspapers.com : accessed 27 March 2019). This is an excellent obituary that lists the deceased's birth date, death date and place, names his wives and children, and tells a bit about his health, his belief, and his life. I have James Franklin Seaver (1842-1926) in my RootsMagic family tree, with both wives and the four mentioned children. Mary Ann (Cline) Seaver (1840-1868) was buried in Scotland county, Missouri, so that's why James was buried there. The second wife, Elizabeth Palmer (1837-1916) died in Clark County, Missouri, The 1900 US Census lists a daughter Dora V. Seaver, born in 1886, for them; perhaps she died before marriage. I am not related to this Seaver family. Their earliest American Seaver ancestor was Henry Seaver (1742-1810), born in Germany and died in Virginia.